The herbs on our shelves are just beautiful, in full fragrance, flavor and fresh from our greenhouses. With such variety available, we are frequently asked, “What herbs should I start with in my herb garden?” We like to ask "What kinds of herbs do you like to eat?" It's always a good idea to plant what you like best. Parsley, Basil, Dill, Sage, Rosemary, Lavender, Thyme and Oregano are all excellent for beginners. As an added bonus they are on sale this week for 30% off! Kyle, Perennial Manager, says it is the perfect time to plant English Thyme, Sage, ‘Extrakta’, Parsley, and Basil together. Sage ‘Extrakta’ is an improved variety of the common or culinary sage due to richer essential oils. And English Thyme is the best for cooking with its broad, dark green leaves, perched on a good hearty stem. Sage and Thyme are both perennials and grow well in average garden soil and in a well drained container. If you plant in a container be thinking about a location to transplant the sage and thyme for next year. 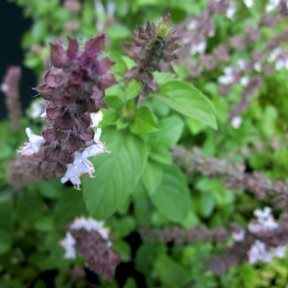 Our Sweet Basil is perfect right now and African Blue Basil is another highly recommended culinary herb. African Blue has a green leaf with reddish stems. It has an intense flavor, is an excellent for cooking in soups and stews, and works well for drying and preserving. These are just 2 of the 28 types of basil we carry. Here’s a yummy snack idea using fresh basil. Toss some fresh chopped Basil in warm melted butter over hot popped popcorn. It’s just the best summer snack—try it! The most popular culinary Parsleys are Curled Leaf and Italian Parsley (a flat leaf variety). Parsley is said to be the most nutrient-rich foods on earth and are excellent for culinary use. Perennial Retail Manager in Aurora, Joannie's edible Parsley of choice is Italian because it has a more intense flavor than Curled Leaf. Neither the Basil nor Parsley are winter hardy in our area so we have to plant, plant, plant and store away for use this fall and winter. The three best ways to preserve herbs are freezing, air drying and oven drying. Both parsley and basil can be preserved well by freezing. Just cut it into small snippets, freezing quickly on a cookie sheet and then storing in plastic bags in the freezer. Air drying by hanging herbs in bunches in a warm, dark, dry place, air drying, until leaves are crisp and dry. Pick the dried leaves from the stem and store in labeled jars. Oven drying can speed the drying process, in just a half hour, at 150° in the oven, a thick layer of herbs on a cookie sheet will be dried. For a fun hostess gift, put dried herbs from your garden in labeled jars to your neighbors and friends. It’s been a hot, humid season and there is nothing like a fresh mojito, sangria or tea with fresh mint. 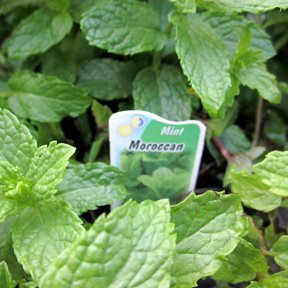 We carry over 13 varieties of mint and recommend the Kentucky Colonel, Mojito, and Moroccan Mint as wonderful culinary varieties of spearmint that will refresh any beverage, salad, dip or entrée. Mints as a general rule grow well pretty much anywhere. We strongly recommend planting in a container. The fragrance from mints is beautifully pungent. The Chocolate Mint is wonderful on vanilla ice cream and the addition of pineapple mint will make that fruit salad taste fresher than ever. Kathy, our employee in Annuals, loves having her herb containers right near where she is cooking. She recommends having it nearby, not only, for ease in using the herbs in her cooking and recipes, but it makes it convenient to water and when necessary add new plants.